"Covers everything from start to finish in training plus problems that every trainer runs into." Great book. It was recommended to me by someone while I was at a hunting test. Covers everything from start to finish in training plus problems that every trainer runs into. Easy to read and very informative. Love the binder with all three books attached. "Evan Graham does a wonderful job of explaining retriever training progressively." Evan Graham does a wonderful job of explaining retriever training progressively. "Jam packed with useful information." The Complete Smartworks kit is jam packed with useful information. I would definitely recommend this product. This is my first lab. I am training for hunting and she has made a180 for the better in her progress since I've started this program along with an e-collar. Evan's books lay out a clear path to training an all-around hunting retriever. He starts by laying a philosophical approach to developing a relationship with your dog which is important to new dog owners and beginners. The steps to obtaining a finished retriever are clear and incremental. While I feel this program would stand alone as a training program I personally use other resources and trainers techniques to supplement the training process. Overall, it is an excellent read. The format is exceptional and the double spaced large texted is easy on my aging eyes. It includes diagrams and illustrations to help get the point across. The books are durable and should hold up well to field use. Have used smart works from start to finish on two HRCH dogs. Easy to read and follow. Explains things in a great way. Would definitely recommend! This book is very detailed. SmartFetch is one of the more detailed books I have seen on the force fetch process. If you have any uncertainties in this area, it does an excellent job of clearing that up. Swim by is explained well too (as well as many yard drills). This will help you take your dog to whatever level of hunting companion you want. It's a good book, but lacks some specific details. As good an artist as Evan is, you would think he would add more and better quality illustrations. Overall, I like it, but have to supplement with other material. 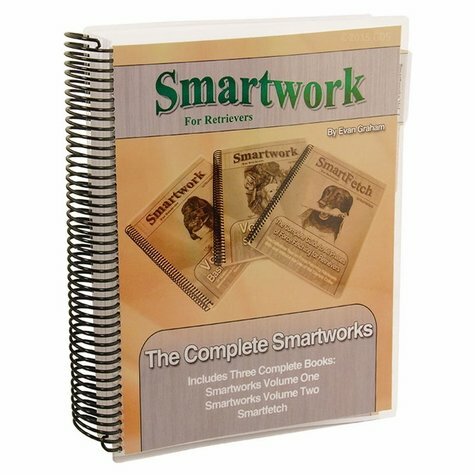 All three Smartwork retriever training titles in one comprehensive book! Smartwork Volume I: Basics and Transition features detailed, easy-to-follow instructions for retriever training, ranging from puppies through basics and early-to-mid transition. Illustrated by the author, this unique training text is designed for your use: It is spiral bound so you can leave it open to the section or diagram you are working on without breaking down the binding. Laminated covers help protect it from the elements. There are "Notes" pages with each diagram to help you track your dog's progress. Also included is a comprehensive glossary to help get acquainted with the language of dog training. 188 pages. Smartwork Volume II: Secrets of the Pros lets you finish your retriever the ways the pros do it by covering late transition through advanced training, helping you transform your "basically-trained dog" into a "fully-trained dog." It also includes tips on maintaining your dog's performance over his lifetime, and field applications to help your dog relate his training to real-life hunting situations, hunt tests, field trial preparation, plus troubleshooting the fully trained retriever. Everything you always wanted to know about dog training but were afraid to ask! 236 pages. SmartFetch is Graham's groundbreaking book that examines the history of force-fetching dogs and its goals and purposes while laying a solid foundation for a fully-trained dog. All obedience issues associated with it are fully explained, plus all phases of the program, from the teaching of "hold" all the way to Water Force. No book has ever been so complete in its discussion about, and instruction for, doing it yourself. 120 pages. See all of Evan Graham's books and DVDs here.